What a thrill, to be captured in a picture with Lysa Terkeurst! The photo was taken thanks to Kathy Kingston on her intelligent phone camera, which she sent to my e-mail almost immediately. The title of the book says a lot. To me, the title Unglued, conveys the idea of something coming apart from that which it’s attached to. Afterall, we use glue to bind things together. Without further looking into what the book is about, I’m guessing it could be about how we may become separated from the persona of what a Christian should reflect in times of stress or crisis. I have heard it said that Jesus is the “glue”. The spiritual glue that keeps us fastened to the redemptive work he finished on the cross. The work that required the sacrifice of his life in order to save our souls. He paid the punishment for our sins through his stripes, suffering, shame, and death. His blood was shed to wash away ours sins and is the foundation of God’s redemptive plan for all of mankind. This is what we cling to, his righteousness. When we invite him into our hearts and receive the forgiveness of our sins, we are clothed in his righteousness. Isn’t it difficult in the midst of the “moment”? In a moment of anger when we blurt what we feel instead of saying what we know we should. Most of us know that a wise answer spoken in the right place at the right time has a peaceable result. but do we always do that? I humbly admit that I don’t always shine. In fact, I said something at the wrong time to the wrong person just last night. After the revival of the She Speaks Conference and Sunday evening service. I had just met a guest at a reception in a family member’s honor and she was using God’s name in a flippant manner. Within 5 minutes, a different word was added to his name. I don’t think I know the variety of “fig” this person was referring to. I was floored by what was said. I can tell you the person I said it to put up a wall and retreated in a different area away from me. God did not need me to defend his honor. And he did not need me to ruin the opportunity to lead someone closer to him. I did the opposite. I thank God for his forgiveness and that he will help me yield to him in the next opportunity. Sometimes, we need to learn a thing or two, like extending to others the Grace with which we’ve been lavished. And to pray silently, allowing the Holy Spirit to work in others and at the same time, ourselves. With more opportunities of yielding to the Holy Spirit, comes more opportunities to stay glued and look like the Christians we claim to be and to be used for his Glory. What have you learned that will help in some of the unglued moments you’ve experienced? 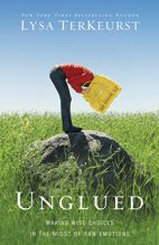 I’ll be giving an overview of this book soon, so stop by to find out what “unglued” is about.